Waving the tricolour, protesters raised slogans like "Pakistan Murdabad," "Global terror Pakistan, LeT Pakistan." They also held placards which read "Pakistan - a terrorist nation" and "Pakistan Progress the country not Terrorism" at the demonstration. 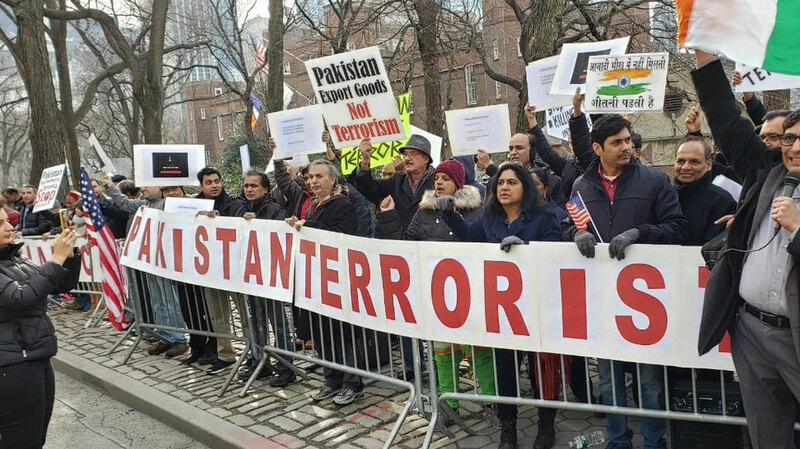 More than hundred US-based Indians protested outside the Pakistan consulate in New York, on 22 February, against #PulwamaTerrorAttack. #WATCH Members of Indian community protested outside the Pakistan consulate in New York,US on 22 February, against #PulwamaTerrorAttack. The UN Security Council has also condemned in the strongest terms the "heinous and cowardly" February 14 terror attack in Jammu and Kashmir. The US President was responding to questions on last week's terrorist attack in Pulwama district of Jammu and Kashmir in which 40 Indian security personnel were killed. Pakistan-based terror outfit Jaish-e-Mohammad (JeM) has claimed responsibility for the attack.